Western New York has had a number of great Polish singing societies. From the Echo Society in Niagara Falls to Chopin’s in Cheektowaga, the songs of Poland could be heard in every corner of Polonia. In their heyday just about every society had their own building where they could maintain their music library, practice, and enjoy a drink with friends. For the Polish Singing Circle, the address of their home was 1170 Broadway, a building that is as iconic as the group itself. 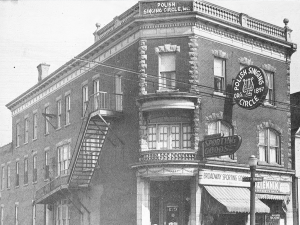 In late 1897, a number of young men began to meet at Nowak’s Hotel with a desire to start an organization that would help maintain links to their Polish culture. At a meeting on September 5, 1897, the 40 men decided they would preserve their love of Poland with song. They chose the name Polskie Kolo Spiewackie or the Polish Singing Circle. Soon John M. Chrzanowski was elected the first president, Peter Piotrowski vice president, Wladyslaw Nowak as secretary, and Leon Olszewski was selected as conductor. The newly-formed group began practicing every Friday evening and continued to sign up members. After five months they were ready, and on February 18, 1898 the 64-voice choir took to the stage and gave their first performance. The outing was a success and soon brought more members. The next year the kolo decided enter the national music scene and joined the Polish Singers Alliance. On the local front, they held a benefit concert for the Polish Reading Room, raising money to enhance the library’s literary holdings. As the men’s singing circle grew in popularity, women soon wanted to join. These women would go on to form the all-female, Kalina Singing Society. As the circle continued to perform, hold benefits, and sing across the country, it became necessary for the group to legally incorporate, which they did in 1902. The next big move for the Polish Singing Circle would occur in 1916 and their purchase of 1170 Broadway. Designed by Wladyslaw H. Zawadzki, the iconic three-story red brick building, with its musically inspired iron work, and corner balcony would host countless dignitaries, card parties, and musical events. Completely remodeled by the kolo, their home would boast a parlor, music room, library and reading room, and performance hall. In 1978, it would be designated a landmark by the Buffalo Preservation Board. While many groups stayed within the confines of Polonia in the first quarter of the 20thcentury, the Polish Singing Circle pushed to mingle with larger Buffalo. On May 16, 1921, with a membership of over 375, the circle performed a concert at the Elmwood Music Hall, the first Polish group to do so. The concert was a breakthrough, winning praise and being called “superb” by the English-language press. This was a truly great accomplishment when considering the same publication used the subheadline, “Convention of Men with Unpronounceable Names” for a Polish National Alliance rally. Over the next few decades, the circle would make Paderewski an honorary member during one of his visits, raise money for the Polish Orphanage on William Street, and continue to participate in the Polish Singers Alliance. The kolo began to see a decline in the Post-War Era, but maintained a healthy membership until the late 1980s. In the 1990s, they experienced both the pain of selling their building 1170 Broadway and the joy of celebrating their centennial. Gramigna, Glenn. "Centennial Concert Marks Century of Song and Service for Kolo." Am-Pol Eagle [Cheektowaga, NY] 10 Apr. 1997: 11. Print. "Home of Polish Singing Circle Was Community Landmark for Many Years. "Am-Pol Eagle [Cheektowaga, NY] 10 Apr. 1997: 11. Print. "Opposite Poles." Buffalo Courier [Buffalo, NY] 11 Sept. 1889: 5. Print. Pamie̜tnik Złotego Jubileuszu 1901-1951 Towarzystwo Śpiewu Kalina, Buffalo, New York. Buffalo, NY: Publisher Not Identified, 1951. Print. Pamie̜tnik Z Okazji Złotego Jubileuszu 1897-1947, Polskiego Koła Śpiewackiego, Buffalo, N.Y. Buffalo, NY: Polskie Koła Śpiewackie, 1947. Print. "Poles Here To Offer Tribute to Paderewski." Buffalo Courier-Express[Buffalo, NY] 16 Mar. 1928: n. pag. Print. "One of Polish Descent. Now, the Poles." Buffalo Courier [Buffalo, NY] 22 May 1921: 58. Print. Polish Singing Circle. 75th Anniversary Banquet and Ball. N.p. : n.p., 1972. Print. "Polish Singing Circle -- A Century of Service." Am-Pol Eagle [Cheektowaga, NY] 10 Apr. 1997: 2. Print.